The Bangladesh–India border, known locally as the International Border (IB), is an international border running between Bangladesh and India that demarcates the eight divisions of Bangladesh and the Indian states. Bangladesh and India share a 4,156 km (2,582 mi)-long international border, the fifth-longest land border in the world, including 262 km (163 mi) in Assam, 856 km (532 mi) in Tripura, 180 km (110 mi) in Mizoram, 443 km (275 mi) in Meghalaya, and 2,217 km (1,378 mi) in West Bengal. The Bangladeshi divisions of Mymensingh, Khulna, Rajshahi, Rangpur, Sylhet, and Chittagong are situated along the border. A number of pillars mark the border between the two states. Small demarcated portions of the border are fenced on both sides. The Land Boundary Agreement to simplify the border was ratified by both India and Bangladesh on 7 May 2015. The border is used as a route for smuggling livestock, food items, medicines, and drugs from India to Bangladesh. Moreover, illegal immigrants from Bangladesh cross the border to India. Because of a large number of illegal immigrants crossing from Bangladesh into India, a controversial shoot-on-sight policy has been enforced by the Indian border patrols. This policy was initiated with reports of violence between the illegal migrants and Indian soldiers. The border has also witnessed occasional skirmishes between the Indian Border Security Force (BSF) and the Border Guards Bangladesh, most notably in 2001. In July 2009, Channel 4 News reported that hundreds of Bangladeshis were killed by the BSF along the Indo-Bangladeshi Barrier. The BSF claims that the barrier's main purpose is to check illegal immigration and to prevent cross-border terrorism. In 2010, Human Rights Watch (HRW) issued an 81-page report which brought up uncountable abuses of the BSF. The report was compiled from the interviews taken from the victims of BSF torture, witnesses, members of the BSF, and its Bangladeshi counterpart. The report stated that over 1000 Bangladeshi citizens were killed during the first decade of the 21st century. According to HRW, BSF did not only shoot illegal migrants or smugglers but even innocents who were seen near, sometimes even people working in fields (farmland) near the border. BSF has often been accused by the Bangladeshi government of incursions into Bangladeshi territory, and indiscriminate shooting of civilians along the India–Bangladesh borders. This was in retaliation to massive illegal immigration from Bangladesh to India, for which the India–Bangladesh Barrier is underway. In a news conference in August 2008, Indian BSF officials admitted that they killed 59 illegals (34 Bangladeshis, 21 Indians, rest unidentified) who were trying to cross the border during the prior six months. Bangladeshi media accused the BSF of abducting 5 Bangladeshi children, aged between 8 and 15, from the Haripur Upazila in Thakurgaon District of Bangladesh, in 2010. The children were setting fishing nets near the border. In 2010, Human Rights Watch has accused the Border Security Force for the indiscriminate killings. BSF forces killed and hanged the dead body over the fence – that of Ms. Felani (a 15-year-old Bangladeshi girl) – on 7 January 2011. Many conferences have been held between India and Bangladesh to discuss such issues as smuggling and trespassing, cattle lifting, and trafficking of drugs and weapons. Colonel Muhammad Shahid Sarwar of BGB gave BSF a list of miscreants which took place in India, and the BSF side also handed over a similar list to the BGB. The enclaves or chitmahals (Bengali: ছিটমহল) between India and Bangladesh border in the Indian state of West Bengal were a long-standing issue between the countries. The enclaves were reputedly part of a high-stakes card game or chess games centuries ago between two regional kings, the Raja of Cooch Behar and the Maharaja of Rangpur, and the result of the confused outcome of a treaty between the Kingdom of Koch Bihar and the Mughal Empire. After the partition of India in 1947, Cooch Behar district merged with India and Rangpur went to then-East Pakistan, which became Bangladesh in 1971. The prime ministers of India and Bangladesh signed a Land Boundary Agreement in 1974 to exchange all enclaves and simplify the international border. In 1974 Bangladesh approved the proposed Land Boundary Agreement, but India did not ratify it. In 2011 the two countries again agreed to exchange enclaves and adverse possessions. A revised version of the agreement was finally adopted by the two countries when the Parliament of India passed the 119th Amendment to the Indian Constitution on 7 May 2015. Inside the main part of Bangladesh, there were 111 Indian enclaves (17,160.63 acres), while inside the main part of India, there were 51 Bangladeshi enclaves (7,110.02 acres). In respect of adverse possessions, India received 2,777.038 acres of land and transferred 2,267.682 acres to Bangladesh. Under the agreement, the enclave residents could continue to reside at their present location or move to the country of their choice. The adverse possession of Boraibari went to Bangladesh. The undemarcated borders between the nations were also finally solved with respect to Daikhata-Dumabari, Muhurichar (an island in the Muhuri River), and Pyrdiwah. India and Bangladesh had engaged in eight rounds of bilateral negotiations starting 1974, but it remained inconclusive until 2009. In October 2009, Bangladesh served India with notice of arbitration proceedings under the UNCLOS. The Arbitration Tribunal delivered the ruling on 7 July 2014 and settled the dispute. Kawarpuchiah integrated checkpost, opened in Oct 2017 by Prime Minister Narendra Modi. Transport between India and Bangladesh bears much historical and political significance for both countries, which possessed no ground transport links for 43 years, starting with the partition of Bengal and India in 1947. After the establishment of Bangladesh following the Indo-Pakistani War of 1971, bilateral relations improved considerably, but the two governments moved slowly on implementing a 1980 agreement on improving transport links. The Kolkata–Dhaka Bus started in 1999. In 2001, another bus service was launched to connect Dhaka with Agartala, the capital of the Indian state of Tripura, the second largest city of Northeast India that borders Bangladesh in the east. In 2015 June direct bus service from Kolkata to Agartala via, Petrapole, Dhaka, Akhoura began. The service is operated by West Bengal surface transport corporation. Before partition India and Bangladesh had multiple rail links. In the 21st century the countries are only connected by rail links on the Western Bangladeshi border, although there are plans to rebuild some of the other rail links. 2 scheduled passenger trains run between Kolkata and Bangladesh as the Maitree Express and the Bandhan Express. The project has run into several delays and there is no clear completion date for the project yet. The barrier when complete will be patrolled by the Border Security Force. The fence will also be electrified at some stretches. The BSF claims that the barrier's main purpose is to prevent smuggling of narcotics. India is constructing the India–Bangladesh barrier, a 3,406-kilometre (2,116 mi) fence of barbed wire and concrete just under 3 metres (9.8 ft) high, to prevent smuggling of narcotics. Out of this, 500 kilometres (310 mi) of fencing was completed at the cost of ₹28.81 billion (US$400 million) by November 2007. The deadline for project completion was set to 2008–09. By October 2009, about 2,649 kilometres (1,646 mi) of fencing along with about 3,326 kilometres (2,067 mi) of border roads were completed. The deadline for project completion was revised to March 2010. By March 2011, 2,735 kilometres (1,699 mi) of fencing was completed and the deadline was revised to March 2012. Assam shares 263 kilometres (163 mi) of border with Bangladesh out of which 143.9 kilometres (89.4 mi) is land and 119.1 kilometres (74.0 mi) is riverine. As of November 2011, 221.56 kilometres (137.67 mi) of fencing was completed. India has completed the installation of flood lights for 277 kilometres (172 mi) in the West Bengal sector. Sometimes between 2001 and 2006 Bangladesh Border security troops (BDR) clashed with the Indian Border Security Force when the fence was built beyond the no man's land. ^ "Border Management: Dilemma of Guarding the India–Bangladesh Border". IDSA. January 2004. ^ "Parliament passes historic land accord bill to redraw border with Bangladesh – Times of India". Retrieved 17 November 2016. ^ Read, Anthony; Fisher, David (1998). The Proudest Day: India's Long Road to Independence. New York: W. W. Norton & Company. p. 482. ISBN 9780393045949. ^ "WordPress.com". Retrieved 17 November 2016. ^ Adams, Brad (23 January 2011). "India's shoot-to-kill policy on the Bangladesh border". The Guardian. London. 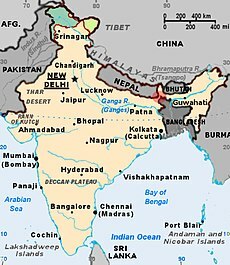 ^ "India: New Killings, Torture at Bangladeshi Border". 24 July 2011. Retrieved 17 November 2016. ^ "BSF jawan killed in ambush near Bangladesh border – Latest News & Updates at Daily News & Analysis". 6 August 2010. Retrieved 17 November 2016. ^ Staff Correspondent (24 April 2005). "Border tension flares as BSF kills 2 more". The Daily Star. Retrieved 19 April 2007. ^ India says 59 killed over last six months on Bangladesh border, Reuters, 24 August 2008. ^ "15 Years Innocent Bangladeshi Girl Felani Killed by Aggressive Indian Border Security Force (BSF)". Retrieved 17 November 2016. ^ "The Constitution (119th Amendment) Bill, 2013" PRS India. Accessed 10 May 2015. ^ India (2 December 2014). "Everything you need to know: Land swap in offing with Bangladesh to end disputes". The Indian Express. Retrieved 29 May 2015. ^ Sougata Mukhopadhyay (7 September 2011). "India–Bangladesh sign pact on border demarcation". CNN-IBN. Retrieved 20 September 2011. ^ Special Correspondent (7 May 2015). "Parliament passes historic land accord bill to redraw border with Bangladesh". The Times Of India. Retrieved 7 May 2015. ^ MANOJ ANAND (8 May 2015). "Bangladesh land swap deal: AGP calls bandh, says PM Modi betrayed people". The Asian Age. Retrieved 8 May 2015. ^ Shubhajit Roy (2 December 2014). "Everything you need to know: Land swap in offing with Bangladesh to end disputes". Indian Express. Retrieved 2 December 2014. ^ Special correspondent (6 May 2015). "Meghalaya groups flay land-swap deal". Calcutta Telegraph. Retrieved 6 May 2014. ^ "UN tribunal puts an end to 40-year-old India-Bangladesh maritime dispute". RT Op-Edge. 16 July 2014. Retrieved 29 May 2015. ^ Malhotra, Jyoti (18 June 1999). "Bus maps the route to better Indo-Bangla ties". The Indian Express. Retrieved 21 April 2008. ^ "Kolkata–Dhaka Moitree Express flagged off". The Times of India. Times Internet Limited. 14 April 2008. Retrieved 21 April 2008. ^ a b c "Centre has fenced 3406 km along Indo-Bangladesh border". Thaindian news. 27 November 2007. ^ a b "Indo-Bangla border fencing to be completed by March 2010". Zee News. 9 October 2009. Retrieved 6 August 2012. ^ a b "Bangla border fence deadline extended". The Assam Tribune. 17 March 2011. Retrieved 6 August 2012. ^ "Fencing along India–Bangladesh Border". Ministry of Home Affairs, Govt of India. Retrieved 7 August 2012. ^ "India–Bangladesh News from India". India Monitor. Archived from the original on 28 September 2007. Retrieved 11 July 2007. This page was last edited on 1 March 2019, at 23:13 (UTC).